In March of 1919, one of the most important decisions ever made at our YMCA took place during a Sunday evening Board of Directors meeting in Keene. Before we can cover that historic vote, we need to understand the context of what was happening at that time. In the previous year, Daniel E. Lorentz, the second Director of Cheshire County YMCA, had been heavily involved in raising funds for Y work in World War 1 and hosting two short-sessions of Camp Takodah on Tolman Pond. There had been 25 boys and 5 volunteer leaders in attendance that summer. It had all gone quite well but, after having spent a few seasons at that site, Mr. Lorentz knew it was finally time to grow beyond the limitations he faced out in the isolated woods of Nelson, NH. That autumn, after the war formally ended in November, the search was on. Daniel petitioned the Board of Directors and demonstrated that he could generate sufficient interest in a County-wide Camp. A committee was formed with several of the Directors, including Elgin Jones, Harold Dickinson, and Robert Woodward. Henry Brown, a founding member of the Y, Great-Grandfather of a current Board Member and past President, and Great-Great-Grandfather of a current camper, also served on the committee. Their singular task was to locate a suitable location that would allow Takodah to develop its program, establish new traditions, and grow for decades to come. Soon after, they discovered a plot of sixty acres in Richmond, NH owned by a Keene veterinarian named Dr. B. C. Russell. The plot consisted of 30 acres of wooded land with “a marvelous hemlock grove on a hill” overlooking 30 acres of water that connects to the Tully Brook watershed area. It had one permanent building, with no power or plumbing, and one small open space for sports and programming. Other than that, there was nothing more than a short, unremarkable dirt road in the woods in a little town rarely visited by those who lived and worked in the city to the north. In fact, just a few months prior, Dr. Russell had tried to sell the property to a private school for boys based in St. Louis but those plans never materialized. They simply didn’t think they could do much with the property and they were concerned that the cost of development would be too high. And so, Dr. Russell’s lack of luck quickly became the Y’s very good fortune. The vote was unanimous. The die was cast. The property was ours. 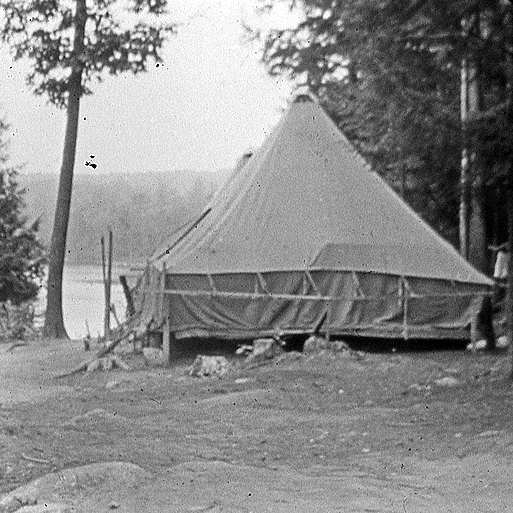 In a report to the Board, dated June 15, 1919, Mr. Lorentz expressed sincere enthusiasm for the new Camp site and predicted great success in the coming years. If only he could have known how right that sentiment would prove to be. With that, the roots had been put down that would eventually grow to become the magnificent and magical place we have all come to know and love.